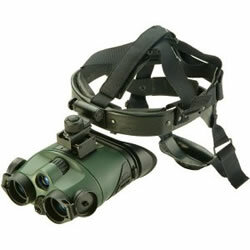 Tracker 1x24 Goggles utilise built-in illuminator for added image clarity in total darkness. The soft, one-piece eyecup prevents external light distortion and light leakage from the device, allowing the user to remain hidden in the night. The flip-top lens caps are an additional feature that allows the lens caps to be moved out of the way with a twist of the wrist. Tracker 1x24 Goggles are distinguished by easy and comfortable handling in any situation. The absence of visual magnification allows comfortable use of NV Goggles while in motion (night gaming, orienteering, driving, safeguarding, search and rescue). In addition, Tracker 1x24 Goggles is irreplaceable for people whose work requires a hands-free binocular in partial or total darkness. The 29031 Headmount is supplied as standard with this variant . This allows hands-free, walkabout operation with 1x magnification approximating what the human eye will. If you have any higher magnification, you will think that you are closer to an object than you really are.